The weather forecasters tell us that a major cold front is due to pass through Cape May tonight. The Northwest and North winds that follow big autumn cold fronts typically bring lots of migrants down to the Point -- raptors, songbirds, dragonflies, and (of course) monarchs. 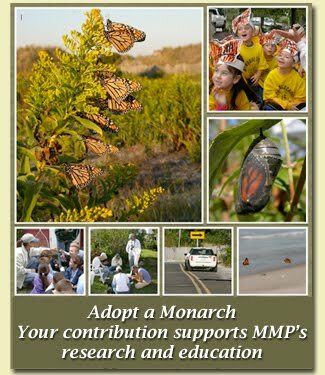 It's still early in the season, but the changing winds could bring the season's first big movement of monarchs into Cape May. Will the gardens of Cape May Point soon look like the photo below? We don't know, but we promise to report back tomorrow and over the weekend to let you know what unfolds.